This essay was first written in Spring 2016 for the Organize Your Own catalog (Soberscove Books, 2016) and is presented here with slight revisions in February 2018 while the exhibit continues to tour. White people are always getting together. We get together in churches and workplaces and informal gatherings. We defy the geographic sorting that might explain our other get-togethers; we even hang-out on the Internet together. White people get together so much that it usually isn’t even named. Except for those composed by extremists on the right or activists on the left, there tend not to be organizations that even acknowledge they are made up entirely or primarily of white people. People getting together—that is power. Organization. Organize Your Own was an exhibition and event series inspired by the dispossessed and working-class white activists in Chicago and Philadelphia during the 1960s and 1970s (the Young Patriots Organization and the October 4th Organization), who sought to organize their own communities against racism. This project take up the question of people getting together generally, with specific examples of people who think they are white people and nonwhite people getting together, together and on their own. This text will meander through a consideration of the relationship between current discourses around race and the role of politics and poetics in complicating and clarifying these ongoing conversations—the ones that happen when people get together. 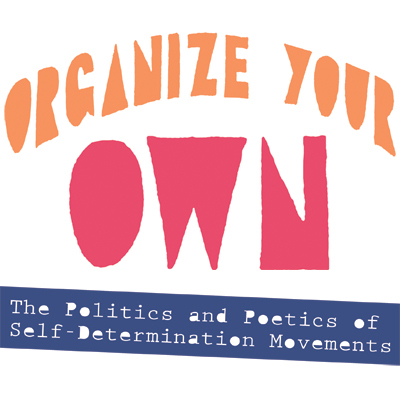 This essay was published in the catalog for Organize Your Own (Soberscove, 2016) and was commissioned by Rasheedah Phillips in order to reflect on themes introduced throughout Organize Your Own. In the time-space offered within these pages, I will briefly reflect on and investigate the following series of questions; chiefly: How does a radical movement conceive of its own future in the face of hostile visions of the future? When the future was never meant for them? How does one reconcile a temporal fatality offered by the mechanical linear timeline, with a belief in the temporal duration of one’s own radical vision in change? How else can we position progress when we exist within our own spatial-temporal environments, and how do we join allegiance with others in spite of that, settling on common visions of the future? If one repositions their temporal lens, these movements, by their very existence and through their radical futurities, meaningfully disrupt linear notions of time. Radical liberation movements reappropriate notions of time and temporality itself, stealing back time to actively create a vision of the future for marginalized people who are typically denied access to creative control over the temporal mode of the future, and redefining that future’s relationship to the past and present. This may involve a reinvestigation and uncovering of hidden histories, and a hacking into future histories where they have already been erased, ensuring their appearance, their continued existence even when the movement’s active period has ended on the linear progressive timeline and receded into the so-called, inaccessible past. One of the tactics for hacking the future is through the technology of printmaking. Marginalized communities and liberation movements have always used printmaking to share their own news and real-time stories, in a world where mainstream media regularly distorts and misrepresents these groups of people. In the Black community, separate press and print media outlets were crucial to counteracting negative images and to preserving counter-memories and counter-histories of events. From Freedom’s Journal, the first Black owned newspaper established by a group of free Black men in 1827, to the Fire!, an African-American literary magazine published during the Harlem Renaissance, to the 20 issues of the Black Panther Party Newspaper published from 1968 to 1973, Black print media has operated as a powerful voice for the oppressed, and one of the most effective technologies for the transmission of culture, art, and news between people across space-time. Similarly, Time of the Phoenix, which is being “re-presented and re-circulated” through the OYO investigation, are four out of print poetry chapbooks featuring poems and stories of impoverished Uptown residents about race relations, urban renewal, police brutality, culture, and life. The name is fitting because isn’t it always the time of the phoenix? These lost voices can be re-positioned as merely enfolded and submerged on the linear timeline, yet always present in the time of the phoenix, cycling through life/death/life. Such ephemera, objects, and artifacts recode time in the long form. Indigenous African notions of time were generally connected to natural events, such as rainfall and the rising and setting of the sun, or saw time as a natural rhythm or pacing, such as the time it takes you to walk from one place to another. Such an experience of time has such features as “concern for details of the event, regardless of time required; exhaustive consideration of a problem until resolved; and emphasis on present experience rather than the past or future.’ Future events are situated in a potential time, until experienced or actualized. Those events do not depend on a specific clock time or calendar date for their manifestation. Instead, time depends on the quality of the event and the person experiencing it. Once the future event is experienced, it instantaneously moves backward into the present and past dimensions. In the essay Femalear Explorations: Temporality in Women’s Writing, Irma Garcia notes that “women’s time is purely affective time, disrupting pre-established schemas and structures,” and how in feminine time in general, “notions of the past/present/future are interdependent and blend into each other.’ The time traveling, Black woman protagonist Dana in Octavia Butler’s speculative novel Kindred demonstrates this blended, affective temporality well. She had to ensure the continuation of her family’s timeline in the Antebellum South, and by extension, her own birth, several hundred years into the future. Michelle M. Wright highlights how Butler and other Black womanist writers, such as Alice Walker, create “bold new models for self-defined or internally defined notion of tradition, one Black and female.” Tradition as understood here emphasizes an overlapping past and present temporal dimensions, and in relationship of those two dimensions to each other, necessarily involves a future trajectory, if considered within a traditional linear temporal construct of forward, progressive movement. I would argue in support of an articulated theory of Black womanist temporalities, given our unique, intersectional temporal experiences as Black and woman (For an example of a Black womanist temporal experience see Radical Futurities essay soundscape by Black Quantum Futurism.). Other DIY and self-determination movements are affirmatively claiming or creating the future by actively engaging temporalities and adopting alternative temporal orientations and frameworks, which in turn helps to shift the meaning or placement of the future and the past (i.e., history), as well as shifts the means of access to the future and the past. Alternative temporalities embodied by such cultural movements as Afrofuturism, and DIY theories as Black Quantum Futurism, have developed practical tools and technologies for exploring reality and shaping past and future narratives. Black Quantum Futurism (BQF) is exploring and developing modes and practices of spatiotemporal consciousness that would be more beneficial to marginalized peoples’ survival in a “high-tech” world currently dominated by oppressive linear time constructs. In crafting new communal temporal dynamics that can function, BQF is developing and enacting a new spatiotemporal consciousness—BQF theory, vision, and practice explores the intersections of quantum physics, futurism, and Black/African cultural space-time traditions. Under a BQF intersectional time orientation, the past and future are not cut off from the present—both dimensions have influence over the whole of our lives, who we are and who we become at any particular point in space-time. Our position from the present creates what that past and future looks like, what it means at every moment. We determine what meaning and what relationships both dimensions of time have to our present moment. 1 Early on, many of us are taught to map out major events, world history, and even our own lives onto a timeline that runs from past to present to future. The timeline typically looks something like a straight line, with major events representing points on the timeline, where time comes from behind us and moves forward. The straight line moving from past to future also represents cause and effect. 2 Wright, Michelle M. Physics of Blackness: Beyond the Middle Passage Epistemology (Minneapolis: University of Minnesota Press, 2015), p. 57. 3 McAdam, Douglas and William H. Jr. Sewell, “It’s About Time: Temporality in the Study of Social Movements and Revolutions,” in Aminzade, et al., eds., Silence and Voice in the Study of Contentious Politics (Cambridge University Press, 2001), p. 112. 4 It is important to note that temporal-spatial traditions varied widely across cultures, countries, groups, and individuals across Indigenous Africa, but that the observations presented in this essay are based on extensive research on space, time, and spiritual traditions of a number of African cultures and groups that yield basic generalizations and assumptions. 5 A Comparison of the Western and African Concepts of Time. 6 A Comparison of the Western and African Concepts of Time. 7 Fisher, Jerrilyn. “Teaching ‘Time’: Women’s Responses to Adult Development,” in Taking Our Time: Feminist Perspectives on Temporality, p. 137. 8 Femalear Explorations: Temporality in Women’s Writing, in Taking Our Time: Feminist Perspectives on Temporality, p. 162. 9 Wright, Michelle M. “Physics of Blackness: Beyond the Middle Passage Epistemology” (Minneapolis: University of Minnesota Press, 2015), p. 56. 10 Wallace, Amy. “War of the Worlds,” Wired (November 2015), p. 97. 11 Butler, Octavia E. Bloodchild and Other Stories (New York: Seven Stories Press, 2005; second edition), p. 134–35. 12 Metropolarity Journal of Speculative Vision and Critical Liberation Technologies (March 2013), Season 1, Episode 1 (zine). This panel asked artists to consider what “organizing your own” might mean in ethnically specific cultural contexts. The four participating artists considered the history of the impact of the Chicano civil rights movement on their organizing and practices as Latinx artists. The panel includes a screening of the film American Revolution 2, directed by Mike Gray and Howard Alk (Film Group, 1969). ERIC J. GARCIA: I’m going to begin with an Aztec legend. The Aztecs believed that they originally came from a mythical homeland north of Mexico, called Aztlán. The Aztecs were nomads at one point. They ventured from Aztlán down to Lake Texcoco, where they eventually made the capital of their empire, Tenochtitlan, which is present day Mexico City. I want you to keep this Aztec myth in the back of your mind because it will be relevant as we move forward. Centuries later, specifically in 1519, Hernán Cortés and his conquistadores arrived in Mexico and conquered the Aztec empire. Inevitably, the Spaniards mixed with the indigenous people and became something new. They created a new mixed culture, a mestizo culture. This mestizo culture rallied against the Spanish crown and was able to cast off the shackles of colonialism in 1821, when Mexico became its own independent nation. Now if we move further north, we see that there is another nation butting up against the once very grand landmass of the Mexican nation. In 1846, the United States, President Polk, and the idea of manifest destiny arrived in the Southwest. What we now know as the Southwest was then the Northern Territories of Mexico. Within two years, by 1848, almost half of Mexico’s nation was taken. California, Nuevo Mexico, Tejas, Arizona, Nevada, Utah, Colorado—all these Indo-Hispano surname states. Do we ever wonder why most of these names are Spanish? It’s because they were once part of the empire of Spain, they were once part of the nation of Mexico, and now they belong in the hands of Uncle Sam. Along with these new territories that the United States absorbed or stole, it also took with them the populations that lived there, the Spanish-speaking populations that had lived in these territories for centuries. The United States, with the Treaty of Guadalupe Hidalgo, promised these populations that their language, religion, and their land would be protected, but unfortunately this was not so. They, the Spanish-speaking peoples, became foreigners overnight in their own land, and this population had to assimilate in order to survive. Unfortunately, it became harder and harder to assimilate in a society that did not like nor want to have anything to do with the “other.” For example, the term “colored”; it doesn’t specifically mean Black people. “Colored” means people of all colors other than white—the “red” man, the “brown” man, the “black” man, and even the derogatory term, the “yellow” man. As we move on through the decades, this inevitably frustrated the Mexican Americans, as they would now be called. They would try to prove their allegiance to this new government— they learned English—but they still could not fit in. Even though they were fighting and dying in wars overseas for the United States, they still were not accepted. They were coming back from wars like Korea and Vietnam, and they were still considered the other, foreign. This frustration inevitably boiled over during the Civil Rights Movement. In the different struggles that were going on in the late 1960s and early 1970s, the Chicanos would use the Black Power Movement as a model for their own struggle for rights, specifically with leaders like Malcolm X and Martin Luther King as their guides and role models. The Black Power Movement was asking: How can we understand ourselves and defend ourselves? How can we self-determine our situation? The Mexican Americans started to ask these same questions. They were trapped in between spaces, as Anthony was talking about, this otherness. They were not accepted in Mexico, and they were not accepted in the United States. They were not accepted on either side of the border. They were born and raised in the United States, but of Mexican descent. There was a disconnect in both nations for these people; they were people without a nation. Eventually, radical Mexican Americans started thinking of themselves in different terms and with a different understanding of being, and they developed the term “Chicano.” With the help of this new term the Chicanos identified themselves as a new movement. With that term, Chicano, they also began to understand that they needed to learn more about themselves, versus just learning about pilgrims and George Washington. They started looking at their own histories and understanding that they had their own heroes and heroines, and they had their own myths and legends, just like the legend of Aztlán. The Chicanos absorbed the specific legend of Aztlán, and they began to use it in their own way to understand that, maybe, that mythical homeland of the Aztecs way up north was actually the Southwest where they lived. And maybe they were going to take back Aztlán from the occupying nation who stole it. And this is how the Chicano movement evolved into a very radical, nationalist, and, sometimes militant, movement. Corky Gonzales, in his Manifesto, El Plan Espiritual de Aztlán, specifically states that art will be used as a tool for the struggle of independence and nationalism. This became one of the core aspects of Chicano art during that time—that it would be used as a tool and a vehicle for the struggle itself. You can see that in this political poster created by Malaquias Montoya, back in 1973. He is equating the Chicano struggle with the struggle that was happening in Vietnam during that time. He is equating his brothers in arms, the Viet Cong, with his own people in the Chicano movement, both of whom were fighting the United States against oppression, against occupation. I think it’s really interesting that they were not looking only within the borders of the United States but beyond, to other international struggles against colonialism. I was fortunate enough to have been exposed to some of the remnants of this struggle in my own life, while I was in school at the University of New Mexico. I was taught by one of the Chicano Studies professors that lived during that time, Dr. Charles Truxillo. He was a radical Chicano Nationalist, very controversial, and I was able to absorb that history and spirit of resistance from him, which I implement into my artwork. History is the galvanizing force behind my art, and I create with the intent of using this art as a tool or vehicle to share the Chicano history with others. This is what became a motivating force to create what I create. I jump between many different media. I paint murals; I draw political cartoons published around the nation; and I do site-specific stuff, as you see here at the National Veterans Art Museum. I mix media and I do different things, but all of the work has the commonality of talking about the past and what it is to be here in the present, and all the political circumstances involved with different complications of race, history and politics that are happening not only here in the United States but abroad. MARIA GASPAR: Hi, my name is Maria Gaspar; I’m an artist and educator. I’m going to focus on one specific community project, a project called 96 Acres that began in 2012. But before I start talking about that project, I want to look at a couple of works that really formed my political imagination as a young artist growing up in La Villita, or Little Village, on the west side of Chicago. I was really inspired by and worked with many murals as a kid. Although I never got to work on the Wall of Respect, for me, that project really represented an interesting, radical way of thinking about the way that communities can create their own kinds of narratives. Created by a group called OBAC, the Organization of Black American Culture, the mural was collectively conceived and produced by artists and non-artists as a way to highlight local black heroes and leaders. This piece by Hector Duarte is a project that he did a couple of years ago where he’s portraying himself underneath these sharp barbed-wire images, his hands held out in almost a position of arrest. This mural is literally on his home, about a block away from the National Museum of Mexican Art. I’m interested in looking at the politics of space, the way that brown and black bodies think about a sort of spatial justice. What are the ways that artists can intervene in architectures of power or powerlessness? How can the body become a political space, inserting itself into a political space and then reclaiming it? But I’m also interested in the idea of legibility and the freedom to also be illegible as a space of freedom. In looking at these architectures and thinking about public space, I’ve been spending a lot of time with my collaborators thinking about borders and walls. This is Border Church in Tijuana, Mexico, where two communities on either side of the wall come together in a ceremony. What are the politics of space and geography? What are the psychological elements of a place like this? The formal and informal elements that monitor behavior, or direct behavior, and the way these spaces keep people apart, spaces like the US–Mexico border. The jail is 96 acres of compound. It is about the equivalent of 74 American football fields. This is a view from the administration building, looking all out towards La Villita, a community of about 80,000 residents, many of them youth. 96 Acres project is a series of community-engaged, site-responsive works that address the impact of the Cook County Jail on Chicago’s West Side and communities of color. We are interested in generating alternative narratives of power and thinking of a way to create a vision of transformation and healing. This is the #60 bus going from the east side of the neighborhood to the west side of the neighborhood, looking at the jail. There are some informal things that happen around the jail every year. Every September, you can experience the Mexican Day parade comprised of floats, cowboys, cowgirls—set up just outside of the jail wall in preparation for the long walk down 26th street. 96 Acres is comprised of lots of educators, artists, activists, many of whom are in the audience, different kinds of collaborators. We’ve worked on audio archives, really focusing on people’s personal stories, first-person narratives, and the sharing of those stories. What we’ve noticed is that when we ask young people, “Who here has had a personal experience with the jail?,” many of them raise their hands. But what kind of spaces or places for dialogue do we create so that we can come together and talk about these things? We organize things like educational workshops, with many different community leaders, artists, educators who are interested in engaging the body, the youth, and the way that youth organizers are organizing in their own high schools and communities, learning from them. Throughout that work, we have produced eight site-responsive of projects that have ranged from zines and comics, to photography projects and a piece by Bianca Diaz, a two-page spread of a comic of mothers who are incarcerated and their families. We have worked with other artists to produce site-specific work; this is a photo studio situated across from the courthouse where the artist took photographs of all the passerby as a way to document and share stories. I’ll show you a little clip from this project by Yollocalli Arts Reach. It’s a reverse graffiti project where they use stencils to remove the dirt from the walls and the sidewalk to reveal text. . . ..
She ends with a really important point—that sometimes people don’t do bad things to be in there. We’re really thinking about and looking critically at the space and thinking about the issues around mass incarceration in this country. We incarcerate two and a half million people, more than any other country in the rest of the world. And she’s talking about the prison industrial complex; she understands that there are private prisons that exist that are mostly imprisoning people of color and the poor. I have a couple other pieces, but I invite you to go to the 96Acres.org website to look at a couple of other projects that we’ve done, including a series of projections that tell stories from both sides of the wall about the experience of incarceration. Anthony asked two questions during his introduction; he asked, “What do we need?” and “What do we do?” And I was recently at a presentation by an artist, Amalia Mesa-Bains, who was talking about equity, organizing, and art . . . she asked the audience, “What do we have?” She was pointing out the resources that communities already collectively have. So I just wanted to put that out there as well: What do we have? Thank you. NICOLE MARROQUIN: The Lower West Side of Chicago has been organizing for a really long time, and these are out takes from a film called Mi Raza: Portrait of a Family, made in 1972 by a filmmaker named Susan Stechnij, who was, according to Olga Herrera, a member of MARCH, the Chicano organizing group. Susan was a student in anthropology at UIC at the time. This is one of the pieces of material that I used when I was working with students at Benito Juarez High School. What I started looking at was a series of school uprisings that happened from 1968 to 1973, more or less. The main organizers of the 1968 walkouts were two Chicago Public School students named Victor Adams and Omar Aoki, featured here in Ebony magazine. Victor Adams was a student at Harrison High School. These walkouts happened in October, a couple of months after Dr. King was killed. The students organized three walkouts in one month; one of them had 28,000 students; another one was estimated at close to 60,000 students. On October 16, 1968, there was a meeting at which Latino students, who were walking out with the Black students, presented their manifesto during a meeting of the Black student organizers. I’m really interested in moments of solidarity between organizing groups, and I feel like there’s so many of these moments that aren’t talked about. I think that movements are led by youth, so my very first impulse was to run to the group of high school students that this would mean the most to, give it to them and see what they would do with the material. Let me read a quick quote from a student named Salvador Obregon who was in the 1968 meeting. He said Principal Burke had threatened him with deportation as an “undesirable alien” if he participated in or led the walkout. This was at a school that’s at 24th and California, which is now Saucedo Elementary. I found this picture [projected], about a month later, of a 1973 walk out. It was all 9th graders who led this. This is a map from 1968, so Juarez is where the heart is but it hadn’t been built yet. I’m talking about Harrison High School and Froebel, which, in 1964 was converted to Froebel Branch—the 9th grade branch of Harrison High School—and here is Benito Juarez, which is where the students who would have gone to Harrison and Froebel before, currently attend. I started to work with Paulina Camacho and her students; she’s the head of the art department at Benito Juarez. I’ve been talking about this with her for a couple of years, and, over time, students have really taken to this project. We got accepted to a conference to talk about the outcomes of the work, which I’m going to show you. This [projected] is the timeline of events, and interestingly I found a picture from 1968 of students marching on the Board of Ed. with a coffin with a cross on it, and then, in 1973, the same community of students having a march with a coffin symbolizing the death of education. The marches were called Liberation Mondays in 1968. The thing I found so exciting about these Tribune articles and the photos, is that it’s similar to what’s happening now, when people say, “It couldn’t be these students; it must be outside agitators.” There’s a bunch of people saying, “This doesn’t have anything to do with civil rights,” and calling the marchers hooligans or pranks. But then there’s this really elaborate performance, and all these props, and the students are organizing in these huge and phenomenal performances! A lot of what I’m talking about here is coming out of a dissertation by Jaime Alanis, who was looking at Red Squad files, currently housed in the Chicago History Museum. The police were the ones who were recording a lot of this information, just so you know. [The students and I] spent a lot of time looking at pictures and investigating what they are; you can’t take it at face value. This is another one [projected image] that I found on eBay. It was actually published in newspapers around the country,. This isn’t, like your romantic, righteous civil rights moment, where you hear electric guitars blaring in the documentary, like in the documentary, Chicano! People were injured and arrested. We can only see what the Tribune printed here. There were four Spanish-language newspapers that followed the story that are not in archived at all. We had a lot of other sources, like the 1973 yearbook. Students at Benito Juarez High School started to work with these images and I thought, “Who is this most important to? Who has the most at stake?” And it would be the 9th graders who attend Benito Juarez High School, which is the school that was built as a result of the uprisings. They know more than I could ever know by digging in any boxes. I realized that staring at the yearbook photos at the faces of the actual people who led the walkouts, who were there, who were either the witnesses or the leaders, that the students would intuitively ask the questions that needed to be asked. The students were thrilled to work with primary sources. I asked them a couple questions: What do you think happened? What would you have done? And what would you ask them? And these people are now around 56 to 60 years old, we figured. Students have been working with the images, and they’ve made hundreds and hundreds and hundreds of collages. The students had all my material at their disposal, at one point, and we were all sort of deducing what had happened. There’s the staircase, there’s the police . . . the riot cops showed up. One student was pretty much on the same page as me, really just wanting to know what happened on the stairs, that day in 1973, and so he animated it. Another student is organizing her own archive, with images that she thinks are the most precious and that need to be saved, putting them in an order that reveals how she is interpreting them. Another student surprised everybody at a critique less than a week ago with this little tiny 2-inch sculpture of Froebel that fits into a box where you have to peek at it through these tiny, itty bitty holes. It’s about a 3- by 4-inch box, which sort of meant that this is all you are able to understand of the story of Froebel. Other students took it into their own hands and did a site-oriented burning piece where they took a giant photo of the riot cops and burnt it at the site where the school was. I’m just going to show you a little part, but they showed it in reverse so that the history would then begin to be revealed. And it says on it, “The truth always comes out in the end.” 64 students are currently proposing their own individual projects. While there’s so much that they’ve seen, there’s so much they haven’t seen. We just got cutting room floor out takes from this film, 100 minutes of them. There’s no sound; it’s just bits and pieces from the lives of the people that lived on the same block as the school and some of the kids that went there. We’ve just started. ANTHONY ROMERO: I work in a lot of different ways, but for the purpose of this panel I’m going to focus on projects that have to do with organized interventions into institutional spaces. A few years ago, myself and an artist named Josh Rios were invited to Texas State University, which is in a small town called San Marcos in South Central Texas. For this project, we decided to create a temporary space that was attached to the art school. We asked all of the art professors who were teaching classes during that semester to give us their syllabi and any lectures that they might have for the week of our residency. We chose a number of courses, one course from each day. We invited a group of students from across the school, so these were not just art students; they were also biology majors and other kind of science majors, mathematicians, etc. Each day we would visit a different class. Students were asked to pay attention to three things: one was the way the architecture of the room impacted their learning. This could be the way that the chairs were arranged, how big the projection screen was, the kind of media the professor was using, etc. The second was the performance of the lecture, how that professor was communicating the information. The third was the larger context of the university. The university was funneling money into a lot of sports activities and was defunding other things. At the end of these class visits, we would all get together and we would share our notes with one another and build performances out of the experience in the classroom. These performances were all open to the public and took place in the main lecture hall. Another recently completed project was that last summer, another collaborator, J. Soto, and I were invited to teach at Oxbow School of Art and use the opportunity to collaborate with the school to create a scholarship for Latina/Latino people to attend the school. I like this project very much because it sits just outside of my artistic practice and has a relationship with these kinds of activities, but maybe more directly impacts the institution and opens up the opportunity for other Latinx artists to occupy similar spaces. The student on the right is the first recipient of the scholarship, which was given out last year; this coming summer will be the second year. The final project is something that I’m working on with a theater company in Mexico City called Teatro Linea de Sombra, a socially engaged theatre company based there. For that project, we’ve connected and will connect with artists in Chicago, as a way to think about the relationships between places like Juárez, Mexico City and Chicago. I just spent the last week in Mexico City: working with these artists. During that week, I was thinking about this quote from the artist Bas Jan Ader: “Who will fight the bear? No one? Then the bear has won.” When I think about the projects that the other panelists have talked about so gracefully, and I think about my own work, I think in part that it has to do with identifying these troubles, the “bears,” let’s call them. And in creating the conditions in which we might return the pressure of that force that is bearing down upon us. As a group, we’ve been talking a lot about the possibility of creating a Latinx Artists Retreat, in a way modeled after the Black Artists Retreat that Theaster Gates has been doing with a lot of other collaborators for a few years. This, I think, emerges from a similar place of both wanting to create the conditions for establishing stronger networks amongst ourselves—creating a kind of political cohesion across our practices and our regions and territories—and also to begin to think about how we might negotiate our entry or reentry or disavowal of pre-existing institutions and organizations. I’m thinking about how nationalism for Black Americans, in particular citizenship, has always been an ongoing struggle, a little bit in a different way than I think Latino Americans sort of deal with. I’ll speak for myself instead of on behalf of all Black people, but I will say that [I understand] this question of not really feeling as a Black individual that I can entirely claim my citizenship to the States, nor can I really claim my citizenship to Africa. I’m wondering if you guys can speak to maybe how that pertains to your coalition. I don’t know if everyone is from the same place; how does that work? How is nationalism maybe or maybe not informing the retreat that you’re talking about? EG: I think that’s super interesting because when we started meeting about this panel talk, we were talking amongst ourselves about where we come from and how each one of us has our own unique places and terms that we identify, even though we’re under the umbrella of Latinos or under the umbrella of Mexican-Americans. I still consider myself a Chicano, from the Southwest. I am originally from Albuquerque, New Mexico; I’m Nuevo-Mexicano, I’m from the other side of the Mississippi. Versus my comrades; some are from the Midwest, some are Tejano. There are all these different labels, even though we’re under some sort of umbrella. NM: I actually was thinking about this concern that I have through the project that I am working on. For example, in 1968 when the organizing was happening, and there was all this solidarity, it was invisible in the news. In the Tribune it would say, like, “the 300 Puerto-Rican students and Black students and ‘others’ march” because they didn’t have any statistics on the Mexican or Mexican-American students because they were categorized as white. My birth certificate says white—that’s how segregated schools were desegregated without having to trouble the waters. All of this changed in ’72 in the case of Cisneros vs. Corpus Christi ISD, when it was determined that discrimination was occurring, and Mexican-American students were re-labeled, and could not be used to desegregate black schools. It’s still a difficult set of terms and we are all coming at it from different ways. I’m from Texas, and I didn’t know anything about this. My birth certificate says white. I didn’t find anything out about this until I was figuring out this history in the process of working on this project. And I’m relatively new to this history situation, and it’s really unlocking a lot for me around these topics. My parents were involved with Chicano movement people in Ann Arbor, Michigan, which is really different; we all are coming from really different places, which makes it difficult to define. MG: I think a lot about how displacement and placelessness, or lacking space, is also really central to being able to unionize or form community. These are just things that are on my mind; I guess I’m just seeing some of the bridges between these two different constituents, groups of people. I have a question that piggybacks off the quote that you ended with, about the bear. What is the “bear,” in the context of providing an interior cohesion of Latinidad? Or providing exterior pathways for alliance that we saw through the documentary? What is the “bear” in your own work, in the sense of the communities that you work in, and in your sense of working across community towards a shared antagonistic frontier, or however you imagine it? EG: I don’t like that animal, the bear. I would say the bald eagle. That’s the one I’m fighting against. And when I say that, I do mean specifically, Uncle Sam. That’s what the Chicano militant movement is talking about, this government in itself. The Chicano movement, was fighting back in the day against poverty, healthcare, foreign wars, domestic wars. The work that I’m creating right now is about those same damn things! This country hasn’t changed very much. I was at the rally the other day against Trump, and it was disgusting. It was ugly to see a new generation of white supremacists out there, young, teenage youth. It was ugly. MG: To add to that, I’m thinking a lot about how do artists or educators, activists, create moments or spaces for liberation. What are the ways that these artistic projects, at least those that I’ve been engaging in with collaborators, how did these projects become spaces to reimagine 96 Acres? Can we collectively reimagine what that space could look like? A lot of the time we can’t imagine it; we don’t have the ability to do that. But as soon as we can start to challenge each other to rethink that and really identify those spaces of oppression—and the jail is in fact one of them—that maybe we can transform that space in a new way through collective action. AR: I think that for me, as a person in the world who happens to be an artist and a person of color from a working-class background, that this sort of confluence of what we might call blessings, has put me in a position in which I encounter lots of different kinds of bears. And lots of different forests. So it’s more difficult to identify what the bear is and where it’s coming from and how we might fight it. As we walk into the forest, we might find that we are lost amongst the trees and are surprised to find the beast in the shadows. This idea of identifying places, or opportunities, in which resources have been evacuated, allows us to create situations in which we might reinvest resources or divert resources into other places. It’s not so simply a question of representation, but rather about the distribution or redistribution of resources. [I have a question] about how the idea or definition of the word Chicano came about. I was born and raised in Little Village, Chicago, and one thing that always sparked me growing up was an identity issue. When I went to Mexico, I really wasn’t part of Mexico, so I wasn’t part of the people there and they noticed that and saw that. And the same has happened to me here in the United States. So it’s kind of like you’re out of tune; you’re just this guitar that’s been played out of tune and you’re just not ever really understood. Does that affect you? Because I really didn’t think of that Chicano word, until you just mentioned it. And it makes sense. But how does it influence your work, your work of art, and how you try to find or evolve this aesthetic? EG: I think I use the word as an advantage to me; I don’t use as a disadvantage. I am able to pick visually and historically and philosophically from Mexico and from the United States, because I’m from both worlds. I have a foot in Mexico and a foot in the United States. Even though I straddle this border. I use it to my advantage. And then along with that, it comes with this baggage of politics of radicalism, and I accept that as well because my artwork is all about history and using it as a way of challenging, but most of all questioning. I’m not giving answers; I’m just posing questions. And hopefully someone else who looks at my art can find some answers from it. Hopefully, I’m praying! If nothing else at least get you thinking or have a dialogue about these bigger issues of who are we, where we come from, and where we stand in the present state. This essay was published in the catalog for Organize Your Own (Soberscove, 2016) and was commissioned by Mariam Williams in order to reflect on one of the projects developed for Organize Your Own by Rosten Woo in the larger context of the exhibition. 2 goes into 24 how many times? Interchangeable words and phrases create a language for separation—its being, its contributors, its equality. What is the mathematical equivalent of unity? January 2016. I’m standing in front of a large white board, maybe 60 x 40”, with about thirty red, blue, and green rectangles printed on it, featuring questions from the American Fact-Finder Survey, the National Health Interview Survey, and the Survey of the American Consumer. Instructions at the top of the board ask viewers to insert small, yellow-tipped mapping pegs to respond to each question, then insert small, black-tipped pegs to represent the three categories they most identify with. Finally, viewers who stick it out through the whole exercise will insert light, blue-tipped pegs into the three categories in which they feel they are most likely to organize. The work is vast and yet filled with minutiae. How did you get to work today? I took the bus/subway/elevated train. I rode my bicycle. I walked. I drove. Pets deserve to be pampered. It’s a halting experience to see hundreds of survey questions blown up to a grand scale. If I were to stand the board horizontally on the floor next to me, it would ascend to more than half my height. The quotidian nature of categorization, whatever intangible quality, which has made it ingrained, has, for a moment, surrendered its power. I must think. How many boxes can I put myself in? Who is asking this? Why do they need to know? What use are the details of my life to them? I volunteer, my hand guiding yellow-tipped pegs. Do you believe Black people will ever be embraced by the country they built? Does that question make you wonder why you still want children? Do you understand the fears of the woman next to you? Have you ever thought about them? Why or why not? What use to me are the details they want to know? When I hear the phrase, “organize your own,” I think of SNCC in 1966. I think of people in 2016, people who likely live, worship, and socialize in places with people of the same race or nationality, talking to each other about racism in the U.S. and either how they experience it or what they can do about it. I picture people going home for Thanksgiving and reaching the point when they can no longer tolerate their drunk uncle using racial slurs to refer to Chinese people. These are the factors for speaking: enough commonality but enough difference and no more tolerance. Same blood, same root. Different regions, generations, and incomes. Aunt Cora, PhD; Uncle James, factory line. When will you settle down and have some kids? When will your sister stop having all those kids? She’s turning into a welfare queen. What goes into organizing your own family? Please (don’t) excuse my dear Aunt Sally (anymore). I take public transit to work and school. The other commuters and I fall into a box, together. Yet some of our differences we can sense. Briefcases vs. backpacks. Shined wingtips vs. Timberlands. Local’s accent vs. tourist’s. Stench of street sleep vs. bed rest on laundered sheets. Do these people feel lonely? Have they reached their goals? Does life at their age look like what they thought it would and what they think it should? What was their day like today? When was the last time they did something for the first time? Mariam Williams is a Kentucky-based writer now living in Philadelphia. She was loving her job in social justice research and was in the midst of pursuing a master’s degree in Pan-African studies from the University of Louisville when she decided it was time to pursue creative writing instead. Williams is a 2015–16 Trustees Fellow in the Creative Writing MFA Program at Rutgers University-Camden. She is interested in the intersections of identity, history, and the arts and wants to put her tangential background to use to help women and girls discover the power and importance of their own voices. The invitation to dive into Organize Your Own and emerge with poems was a juicy challenge – not just an ekphrastic exercise, but an opportunity for us to engage history and community where they meet poetry, which is all the time when seen through lenses (like OYO’s) that are dialed to our moments of making. Before visiting the exhibit, we encountered materials shared with the contributing artists – several poems written by female Young Patriots for Time of the Phoenix (including some by organizer Peggy Terry) and a clip from American Revolution 2, in which Black Panther Bobby Lee roused the Young Patriots to greater self- determination. Many of us were surprised to find language and energy there that was so alive, immediate and exciting. We walked to Kelly Writers House on February 11th, which turned out to be one of the coldest (and sunniest) days of winter in Philadelphia in 2016. We started out from Moore’s campus and followed the river. We might not have been bundled up enough to relax into our journey and our time in nature. We were very eager to arrive. As poets, we had a few things on our mind. We’d been reading and practicing the spirit of Maxine Hong Kingston’s “To Be the Poet,” in which she suggests documenting an alternating rhythm of your seeing and your feeling as a way to show up to your now. Thus, our chilled bones and geographical disorientation were very much a part of our meeting with Organize Your Own. We’d also been thinking about assignments and their inevitable effect on our presence in the moment – how they can help us to show up and also confound our capacity to show up. We read Dorothea Lasky’s mini-manifesto Poetry Is Not a Project and thought about how any loyalty to an idea of what to write might compromise our sharing of lived experience. But then we had many ideas in response to the layers of history and community we encountered at Kelly Writers House. Ideas that felt like living. We hope we’ve collected our loyalties to living, and the spirit in which they emerged, in these poems, as a joyful and diverse response to the artworks and energies of Organize Your Own. Colleen Durant – Woman. Working. This essay was published in the catalog for Organize Your Own (Soberscove, 2016) and was commissioned by Bettina Escauriza in order to reflect on one of the projects developed for Organize Your Own by Amber Art & Design Collective. Two Black men in lawn jockey outfits holding lanterns stand in symmetrical poses, as statues would, in front of a food store on Lancaster Avenue in Philadelphia. The cold interior light from the store spills out onto the street, casting blue shadows on the faces of the men, which are otherwise obscured by night’s darkness. A giant decal of fresh seafood pasted on the left window dominates the scene: bright red crab legs create a downward curve next to a blush pink shrimp, pale potatoes, and a lone broccoli on the bottom left corner, all held within the embrace of an aluminum dish. Inside the store we see a certificate of some kind (perhaps of compliance) pasted on a clear plexi-glass partition, a juice dispenser filled with purple liquid, and in the far distance, the bright fluorescence of a bug light. But what is easy to miss in this photo is the third person standing just beyond the threshold of the large windows, inside the store, their face visible next to the end of the crab legs, partially bisected by the black metal border that holds the panes of glass in place, their body obscured by a large orange vinyl sign advertising a food special. To us, it’s just a floating head really. The image described is one in a series of photographs that document the performance piece entitled Urban Space Jockeys by Amber Art and Design. Though the image was constructed to follow a symmetrical/bilateral composition, it unintentionally follows the Rule of Odds. The three subjects form a strange triangle, oscillating between what is intentional and what is incidental, creating a composition in which the third person in the background is at the apex and center of the image. The strong architectural, geometric lines create a heavy symmetry—a repeated pattern wherein the objects in the individual quadrants formed by the architecture break the rigid symmetry and generate motion for the eyes. The parallel positioning of the subjects constructs a strong sense of weighted balance, really appropriate for a pair of statues that that would flank an entrance—in this case, the statues flank the entrance to the obscured history of the roles of Black people and Black resistance to oppression in West Philadelphia. In their performance piece Urban Space Jockeys, Amber Art engages the complex and hidden history of Lancaster Avenue in West Philadelphia. For the piece, Keir Johnston and Ernel Martinez dressed and posed as lawn jockeys, and were photographed as the statues in different locations. Lawn jockeys have a complicated, layered, and truthfully, unknown, origin. From the legend of Jocko Graves—the Black boy who inspired George Washington by waiting for him and subsequently freezing to death, lantern in hand, along the banks of the Delaware during the Revolutionary War—to the anonymous “faithful groomsman,” or the black jockeys in the Kentucky Derby. By some accounts these statues were used as signal posts for stops on the Underground Railroad, when a cloth of a certain color tied to the arm of the jockey meant this house was safe for African Americans, who were fleeing slavery in the South. In Urban Space Jockeys, Amber Art is referencing all of these histories by becoming the lawn jockeys and reinserting that particular narrative of Black history and the Black body into the contemporary space of the city. Though by its nature, the Urban Space Jockeys performance is external and meant to be consumed by spectators, there is a deep internality to the work that viewers must excavate for deeper meaning. A profound truth of the work is that many aspects of it are only knowable to those who share the experiences of Blackness in this society that have been constructed around the violent and genocidal enslavement and oppression of Black people. The tension between what is knowable and unknowable in the work— depending on who experiences it—is a powerful antidote in a society that seeks to flatten and normalize everything and fix history in place as a story that can be told completely and, that in turn, can be fully understood. Urban Space Jockeys does not function as a didactic history lesson, but rather as an organic encounter with the public, if they are lucky enough to be out there during one of the performances, or view its documentation in an art gallery. For those of us who are familiar with the racist narrative and history attached to the lawn jockey as an object produced by a racist society, the first layer of the Urban Space Jockeys performance is readily apparent, but the ways in which this history is intertwined with the history of Lancaster Avenue lives in a deeper place. Though there is nothing to mark the horizon, the severe angle of Lancaster Avenue is very palpable. The Avenue is loud and alive. During peak hours, a steady stream of people walk down the sidewalk and in and out of businesses, as the flutter of their conversations blends with the buzzing clamor of traffic. Lancaster Avenue has a rich history—originally it is said to have been an ancient Lenni­Lenape road, before becoming the first turnpike, connecting Philadelphia to Lancaster, in 1795. As the first major paved road, it helped to transform the city by easing the flow of goods and commerce that came in on barges through the Schuylkill, then moving through West Philadelphia to Lancaster and beyond. Eventually, Lancaster Avenue became linked to the Lincoln Highway, the first-ever intercontinental highway in the United States, a single line stretching across the land, connecting Philadelphia to San Francisco. Several houses that were stops on the Underground Railroad were located on the Avenue, so just below the surface of the present there is a powerful history of solidarity and resistance to oppression. But, as one walks down Lancaster Avenue, this history is invisible. What Michel de Certeau wrote of New York is also true of Philadelphia (at least in this part of town)— “Its present invents itself, from hour to hour, in the act of throwing away its previous accomplishments and challenging the future.” The present’s unrelenting devotion to becoming the future effectively silences the past. Time is a collection of surfaces that builds the sedimentary rock of the present, and in the orogeny of passing time, things get lost. There is a certain degree of inevitability to this process of muting the past, but there are processes of power at play that shape the muting. Thus, if the history of the resistance to African enslavement, along with other histories, is hidden under the steady bustle of working-class neighborhood commerce, then it happens in service of some kind of logic. Some would say that it is not so nefarious, but I would argue that in a city so obsessed with its own past and its relationship to the beginnings of this nation, the long process that hides the hands and intentions of those who built the present is obscured in this particular narrative for a reason. Urban Space Jockeys is an excavation and presentation of the image of the lawn jockey—both as a historical site of the oppression of Black bodies and of the complex archaeology that links these lawn jockeys to the Underground Railroad, while at the same time actively pointing to the current and virulent process of gentrification that seeks to consume Philadelphia in the coming years. The performance aims to engage the past in dialogue with the present to interrogate the future as it looms in the horizon. In an interview I conducted with the artists, they explained that their aim is to amplify the voices of their community members by telling the history of Black Philadelphia. They are members of and live and work in marginalized communities that exist in a state of constant vulnerability by the forces of racism and capitalism. Through their public interventions, Amber Art seeks to engage with the public in a dialogue about the Black body, both its history and its present. By forging spaces for dialogue, they engage with people in neighborhoods who don’t get to access art through conventional means of a museum or a gallery. Amber Art uses performance as a way of posing questions about race and power, and to bring to the surface Black narratives of resistance to oppression that have been silenced. There is a deep, resonating healing and corrective power to this work, as it actively constructs a world in which that which has been silenced can speak. Their work asks questions about what survives in the collective memory of the colonized, the enslaved, and how these processes unmake, make, create, and recreate the word we live in every day. The intersection of art and activism is rife with contradiction, as are all situations in which power is simultaneously manifested and contested. These contradictions cannot, nor should they, be avoided—they should be actively engaged and deconstructed to see what other formations may arise from questioning and making. As Walter Benjamin wrote: “Our life, it can be said, is a muscle strong enough to contract the whole of historical time. Or, to put it differently, the genuine conception of historical time rests entirely upon the image of redemption.” And perhaps, despite all our deconstruction and construction, we don’t get to fix things—maybe we just make air holes, and that’s okay. 4 De Certeau, Michel. The Practice of Everyday Life (Berkeley, CA: University of California Press, 1984), p. 91. 5 Benjamin, Walter. The Arcades Project (Cambridge, MA: Harvard University Press, 1999), p. 479.